Should you consider getting the drain line inspected at the house you are buying? Nearly 2/3 of the drain lines we inspect require $3,000 in repair or more. This applies to new houses as well as old. Many of the problems found will not be covered by a home warranty or your home owner’s insurance policy. During the home inspection we perform, your inspector will run lots of water down the drains to try and reveal blockages. However, clean water may not reveal restricted drain lines. Until you use the drains regularly or flush paper, food, human waste or soap suds, many restricted drains will appear to be draining well. If roots have entered the drains or fat has collected, even small wads of toilet paper may be enough to block the drain line which can cause the drains to back up and dump sewage into your house. 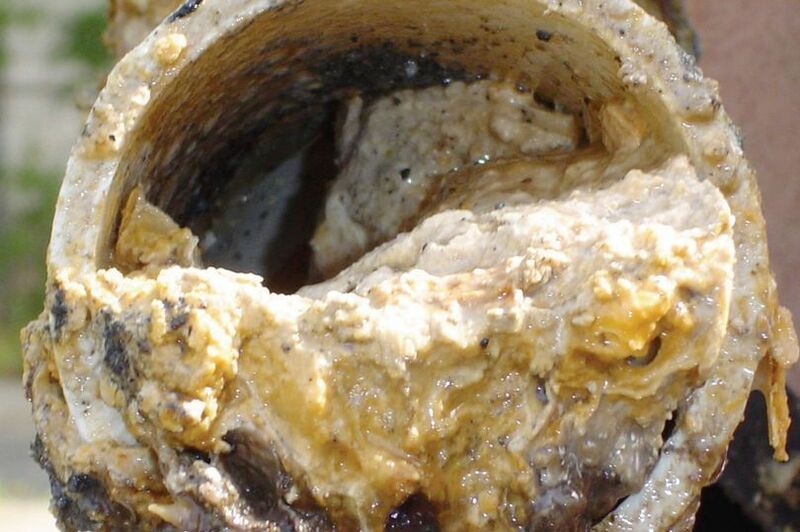 Blockages can only be revealed with the use of a drain line camera. While older homes have a higher risk of damaged drain pipes, even newer homes are susceptible to blockages and failed joints resulting in poor flow or root intrusion. The picture at left shows a cross-section of a drain pipe where cooking fat has collected leaving little room for waste to flow through. In older homes it is particularly important to have the drain lines inspected as older materials such as cast iron or clay pipes may be deteriorated or cracked, allowing roots to enter the pipe. For additional information, please visit our website. Yes! Please add a drain line inspection to my order at a discounted price. To add a drain line inspection to your home inspection at a discounted bundle rate, please email or call our office during business hours when scheduling your home inspection.